Tell me about this photo. You know, I wasn’t born then, either, but I can tell you what happened in Czechoslovakia in 1968. But those who would rule us (or who would elect rulers) sort of fail just about any history exam they’re given, do they not? 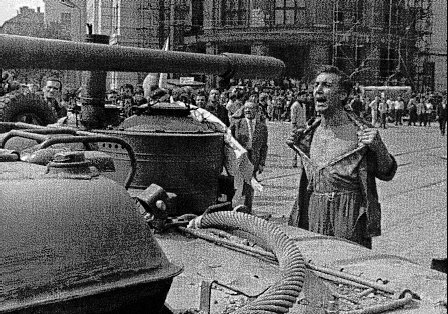 While American students and whatnot were facing down The Man with sit ins, long hair, and all that feldercarb, Czechs and Slovaks were baring their chests to tanks. Sorry, I sorta minimized it. They weren’t just baring their chests to tanks like American university students were standing up to the campus police. I agree. And it is good of you to recognize the anniversary of that battle today. Many Americans dont even know it happened because we – as usual – were too busy with our own struggles. That said. many people have died for the freedoms we en…joy today. Though it wasn’t bloody and gory like Prague Spring or the struggles in Darfur today, every BODY counts. Oppression never occurs without collateral damage. Awesome. And this particularly authoritarian is not unintelligent.